Thirty people have been jailed for 33 armed robberies in shops in England and one in Belgium. There was a raid almost every fortnight over a 16-month period in 2009 and 2010, Kingston Crown Court was told. Groups of robbers dressed in overalls and balaclavas used weapons including sledgehammers, a gun and knives to force their way into stores. 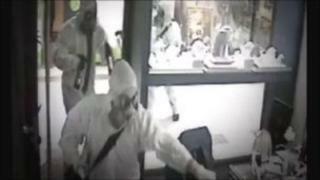 The jewellery they stole were valued at more than £3.5m, the Metropolitan Police said. Jewels were taken from shops in London, southern England, the West Country, East Anglia and Antwerp. The gang also stole motorcycles from dealerships, tying up staff while they loaded bikes into stolen vans. These were later used as getaway vehicles in other raids, police added. As well as those sentenced this week, another 21 gang members were jailed separately between 2008 to 2010.